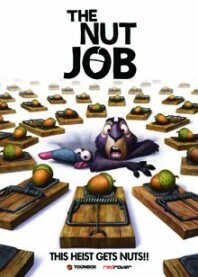 The Nut Job is a new CGI animated feature film that was announced in Animation Magazine’s 2012 calendar. It’s being produced by Toonbox Entertainment and Red Rover International, who are hoping to release it next summer. The director is Peter Lepeniotis, who first introduced his character Surly the Squirrel in a 2005 animated short film titled, appropriately, Surly Squirrel. In this new feature film, Surly and his rat buddy (named Buddy) must contend with a new group of rodents who invade their city park home. Not a lot to go on yet, but the film does have an entry up on IMDB, and Toonbox also has an web page for the project. Word is that The Nut Job may be developed into a TV series also. It's finally coming on January 17, 2014! The theatrical trailer just went up. Open Road Films is distributing it, and the voice cast includes Liam Neeson, Brendan Fraser, Katherine Heigl, Will Arnett, Stephen Lang, and Maya Rudolph. "Shut the Front Door" as a replacement for "Shut the F*** up" was actually done before by an oreo commercial.... which was taken from a gum commercial... so getting kind of old.